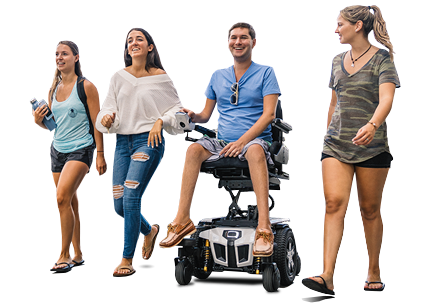 I have been using Quantum® Wheelchairs since I was about 12 years old and I have loved each one, but as time has passed the one thing that I’ve learned is that accessories for my chair can make a huge impact on my day-to-day life. Here are the accessories I love and use daily. I cannot tell you how much I love my fender lights. Luckily, they come standard on all new Edge 3 power wheelchairs! You might think the best benefit of these lights is the ability to turn them on when you’re out at night so others can see you and you can see the ground you’re rolling on. Yes, that is a great benefit, but it’s not my favorite. Due to my disability, I regularly use the bathroom in the middle of the night but I hate turning on the lights in the house because they hurt my sleepy eyes. However, with my fender lights I can see around the house with just enough light to use the bathroom and go straight back to bed! I don’t know about you, but my phone is always dying. I used to hate getting stuck in public and feeling like I needed to rush home to charge my phone. Ever since I got my portable USB charger on my motorized wheelchair, it’s no longer a problem! I know I can leave the house at 8 a.m. and not come home until 9 p.m. and both my phone and my wheelchair will last the entire day! It’s great to have a power wheelchair that can last as long as I do, and even better that my wheelchair helps my phone last too! My day doesn’t start until I’ve gotten my coffee, but it’s hard to get ready with one hand on my joystick and the other holding a coffee. Thankfully, my cup holder has solved this problem for me! I can bring my drinks everywhere I go and still have a free hand. When I don’t have a drink in my cup holder, I regularly put my cell phone in it. I know that Quantum has a separate cell phone holder accessory, but I find it really convenient to put it in the cup holder where I can see the screen just as well as I can see my joystick screen! My job has me travelling all the time – whether it’s across the town or across the country, I’m always going somewhere. Generally when I travel for work, I travel alone and there’s no one to help me with my bags, so I use my backpack holders to carry my backpack, laptop bag, and anything else I need. It makes travelling solo a breeze! Additionally, when I finally do get to spend some time at home, my backpack holders are great for carrying my grocery bags so I can get chores done quickly!